By history: On 26 April 1986, the muted explosion and resulting fire within reactor # 4 at the Chernobyl power station near Kiev was caused by a sudden, unpredicted power output surge. Complicated, of course by interlocking human error. When an emergency shutdown was attempted, a more extreme power instability occurred, leading to the reactor internally hemorrhaging. These events exposed the graphite attenuator rods within the reactor to air, causing it to blow up. The resulting fire sent a plume of highly radioactive smoke into the atmosphere and over an extensive geographical area,. Those that were there said it was more of a “pop” than an explosion, followed by a lot of people dying. The engineers involved on site didn’t believe their gauges and ran outside to find what appeared to be graphite shards lying around, which they approached and gawked at, even picked up, absorbing a lethal does of radiation in seconds. A multiplicity of radioactive particles were released into the atmosphere including krypton, xenon, iodine, zirconium-95, niobium-95, lanthanum-140, cerium-144 and the transuranic elements, neptunium and plutonium. Greenpeace published figures indicate that in Belarus, Russia and Ukraine alone the accident could have resulted in an estimated 200,000 deaths from various forms of cancer between 1990 and 2004. “Corium”, a molten mixture of nuclear fuel, control rods, structural materials from the affected parts of the reactor products reacting with air, water and steam ate its way into the basement of the reactor. There was never any meaningful chance of a “China Syndrome” where the lava would bore its way through the center of the earth to the other side. 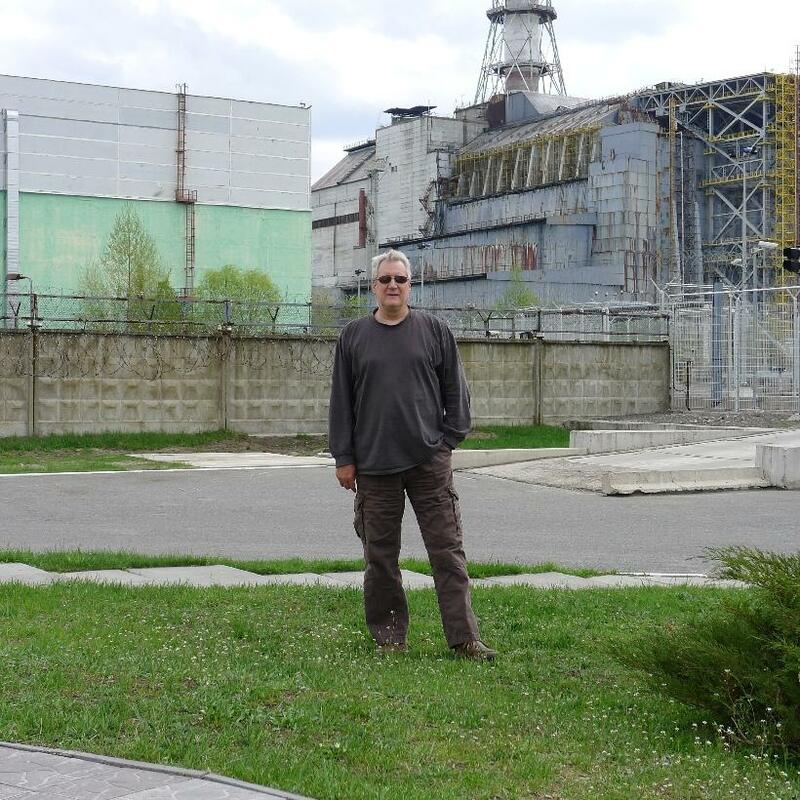 I tour the site: In May 2011, there are three successive checkpoints before one actually gets to the site of reactor #4. The checkpoints begin about 30 km from the site, and are very thorough. They make sure anyone going in actually comes out. On exiting, everyone is checked for total body radiation. Along the way to the site the radiation is measured by the State tour guides, and varies. The usual dose of radiation on a transatlantic flight is about 20 milli-Sieverts. The “red “forest” area measures about 30-40 milli-Sieverts. At several places in the area of reactor #4, we routinely measured 70 and at one point we got 120 milli-Sieverts. Those are fairly hefty doses of juice. The disaster caused somewhere in the range of 1000 plus cubic meters of radioactive lava containing plutonium 239 with a half life of over 24,000 years to melt into the basement where it sits today. No one will ever get near it for essentially eternity. Much like 9/11 the first responders to what was initially thought to be a fire was the mobilization of 26 nearby firefighters, none of who understood the consequences and all of whom died quickly thereafter. There is a memorial to them nearby. It was soon recognized that the area must be sealed, and plans were made to pour concrete into the area, which would be cleaned up by radio controlled robot vehicles. This didn’t work as the radiation messed up the radio controls. So National Guardsmen were brought in and ordered into the roof to shovel off highly radioactive debris wearing lead lined suits. None could work more than 45 seconds at a time and the work was completed over months like a stream of ants. Many of these guardsmen later suffered later from acute and chronic radiation illness. Ultimately the ultrastructure of reactor #4 was filled with a concrete sarcophagus, predicted to last 30 years. It has now been 25 years and the structure is visibly deteriorating, from the front and back. We stood probably a quarter mile from it and measured atmospheric radiation of about 7 milli-Sieverts, which according to the physics of radiation deteriorating exponentially with distance, means the actual site is very radioactive indeed. The problem of Chernobyl is not by a wild stretch over. The “Red forest” (the trees West of the reactor) turned red after absorbing lots of radiation and the entire forest was cut down and buried on site, with new trees planted over them. Now the new trees are mature but the old decaying radioactive tree debris under them are still there and still dangerous. Someday it’ll all have to be dug up and re-buried elsewhere in safe quarters, a project the Ukraine has neither the money nor the space to accomplish. As a practical matter, reactor # 4 will remain unapproachable for eternity. Eventually it will have to be re-covered with concrete at periodic intervals, again a project the Ukraine has neither the money nor the space to accomplish. It’s only a matter of time before radiation leaks into the underground water table, if it hasn’t already. When that happens, the consequences will be dire and essentially un-fixable. This is the evil gift that will keep on giving for a very long time and should not be underestimated. The Japanese disaster, in terms of real danger over time was essentially inconsequential in comparison. 135,000 people were evacuated from the area. The city of Pripyat, a stone’s throw from the disaster, formerly a beautiful and upscale city of 48,000 souls, was evacuated completely in two hours using 1400 busses. Evacuees took only documents and money, leaving everything else. They were resettled elsewhere in the Ukraine. In future years, it was determined that no one would ever be enabled to return and some were allowed in to recover goods from their apartments. However, when the Soviet Union fell in 1991, the economy collapsed and pirates from Belarus crossed the Dnieper and looted all the apartments for whatever could be carried off. The town is now frankly spooky. Clearly a beautiful city in the past, it is now overgrown with weeds and stands totally abandoned, as it will forever. See photos. Driving in Russia deserves special mention. As insane drivers go, Russia hardly deserves mention, but it is a rather interesting experience. The list of lunatics is easily led by Hanoi, a situation of driving in a spinning maelstrom of non-linear quantum mechanics; vehicles dropping through wormholes, appearing and disappearing randomly. Survival is about the same as chance. In Sicily, it’s survival of the most aggressive, with dozens of obscene hand gestures in the offing to emote drivers’ feelings about traffic situations. In Russia, they play vehicular chess. Drivers calculate the probability of other vehicles’ actions, sometimes several moves in advance, and then commit their vehicles to action assuming those probabilities come true. From the back seat you close your eyes and hope when you open them it’s in the same world.